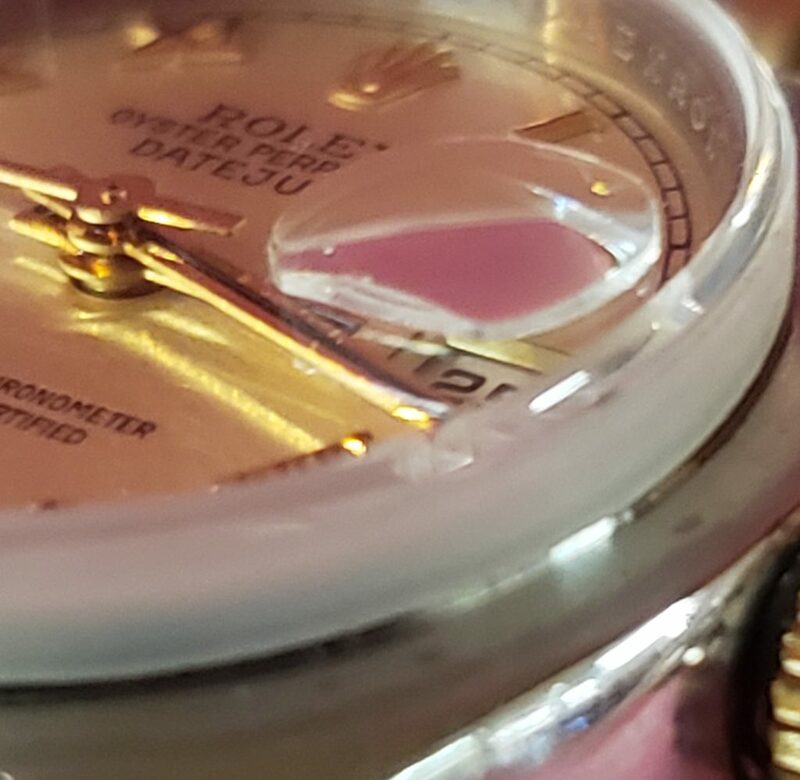 One of the most common repairs that I do every month is to replace a Rolex Crystal. 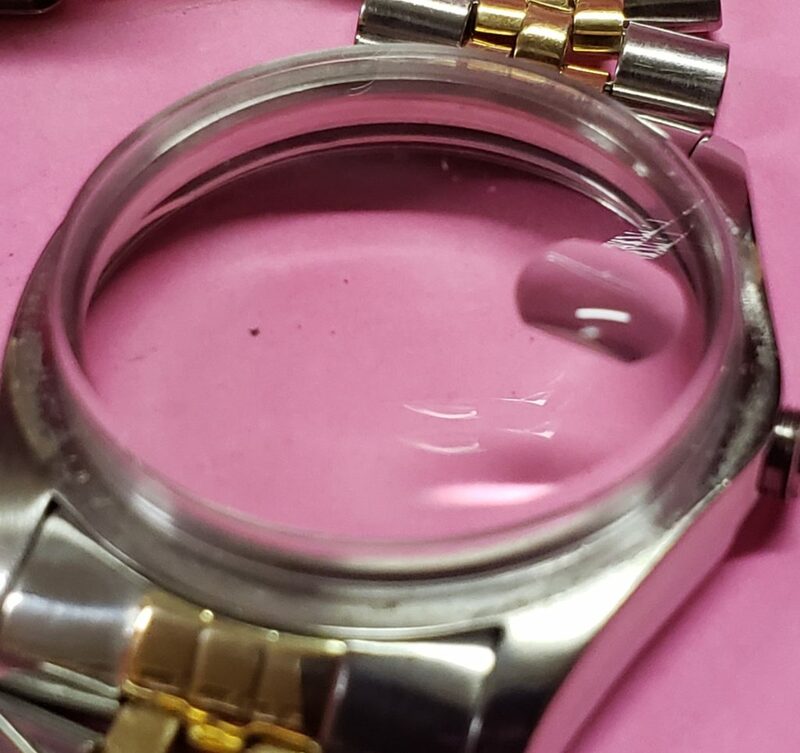 It seems like when a customer drops their watch, it never lands on the soft carpet, but always manages to hit the hardwood floor! 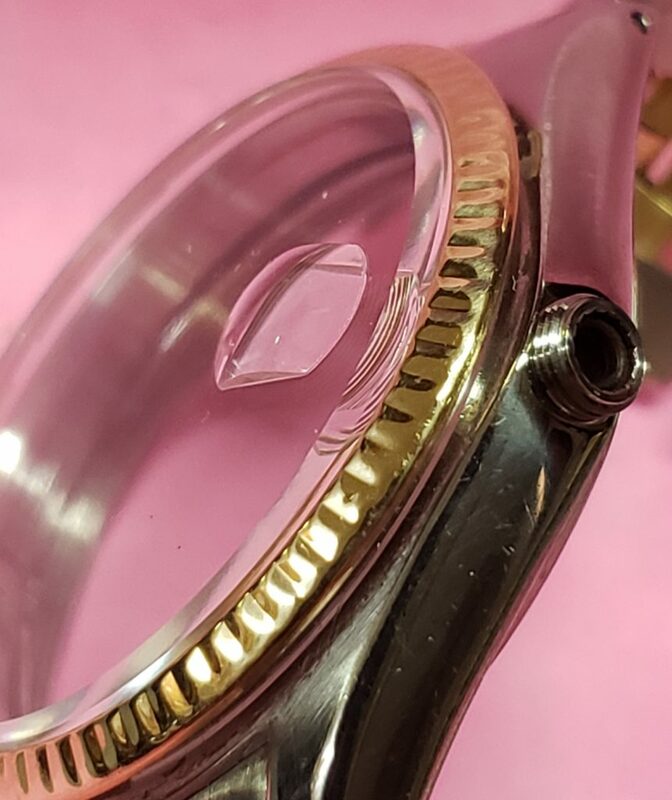 In this blog post I will show the steps that I go through to replace a Plastic and a Sapphire crystal. The Rolex sapphire crystal is a complex part. 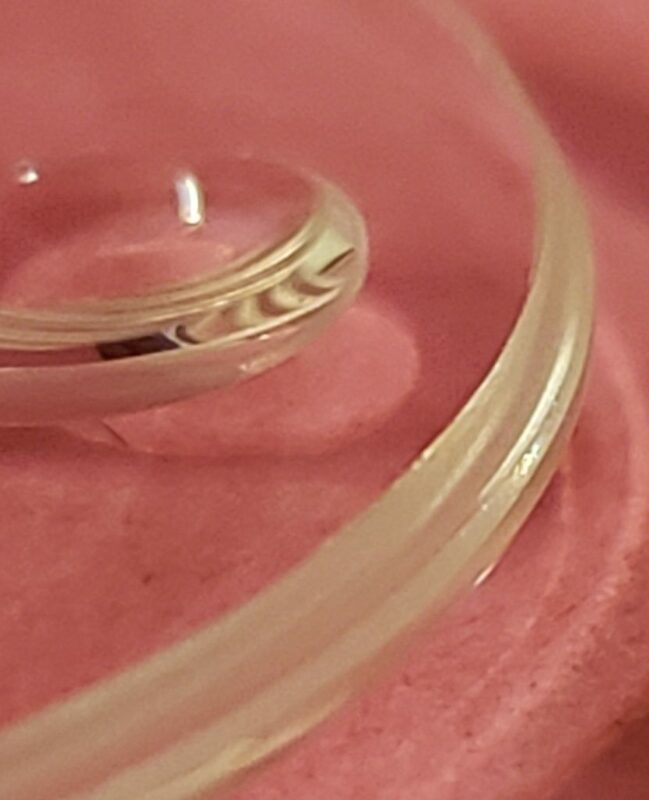 The crystal has a groove cut in the bottom that makes room for the plastic gasket. 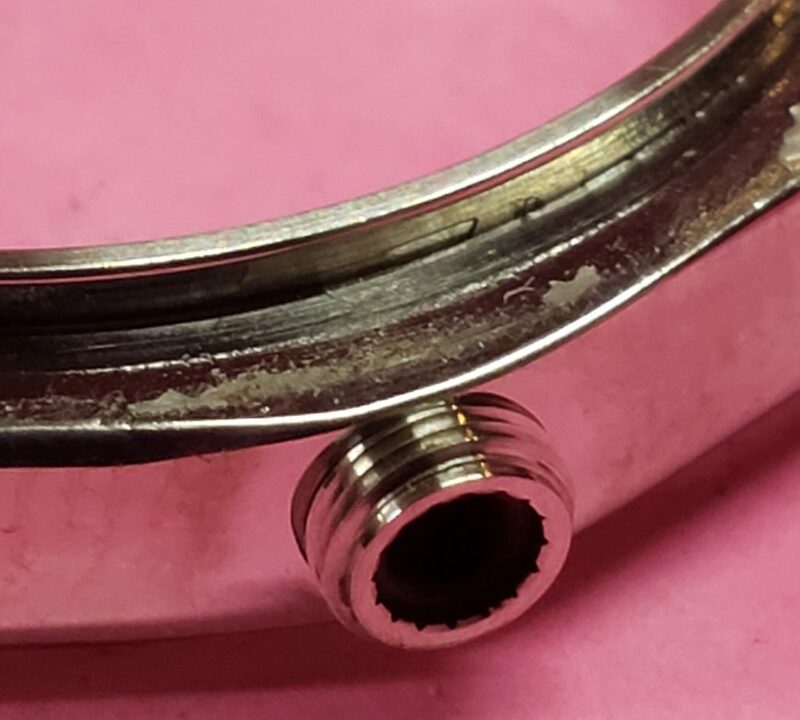 The gasket makes the seal around the case lip that makes the water tight seal that rolex is famous for. Crystal and gasket installed on case. The crystal needs to be installed with the movement in the case. That is the only way to accurately align the crystal magnifier over the date window. 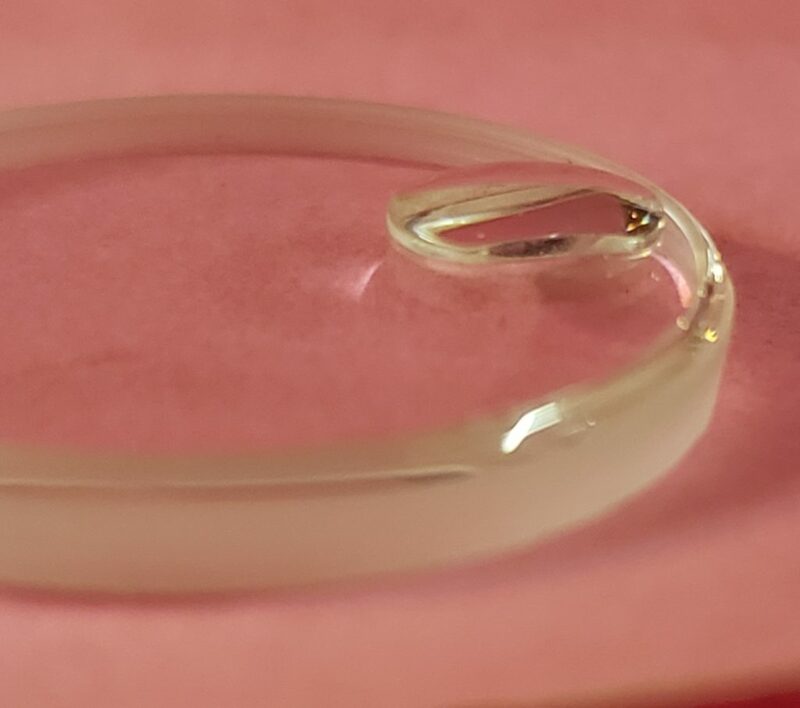 The plastic crystal is a bit easier since it is molded on one place. Same basic process as with sapphire. Plastic crystal installed and ready for the movement. 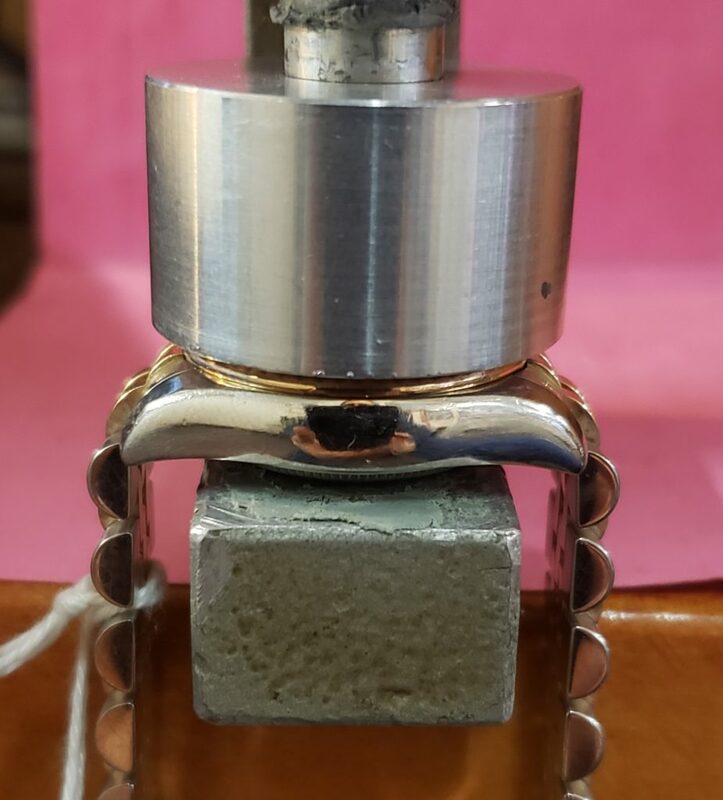 I hope that this gives you a better idea of what goes into replacing a Rolex Crystal. 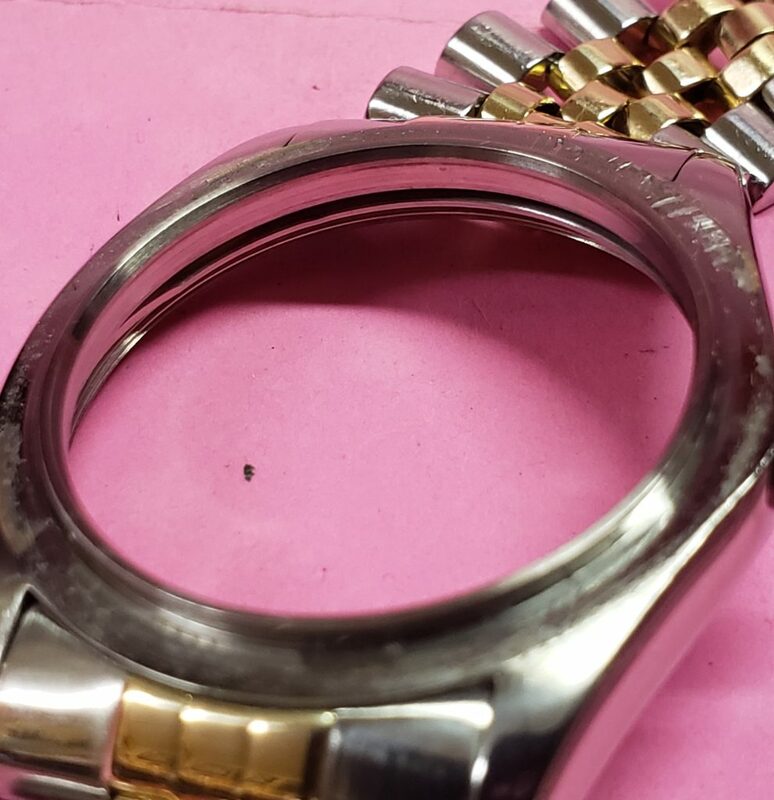 It is not that hard but needs to be done properly to make sure the watch does not leak. A simple thanks for your continuing education of us watch people. Can chips on the edge of a sapphire crystal be polished out, or must the crystal be replaced? 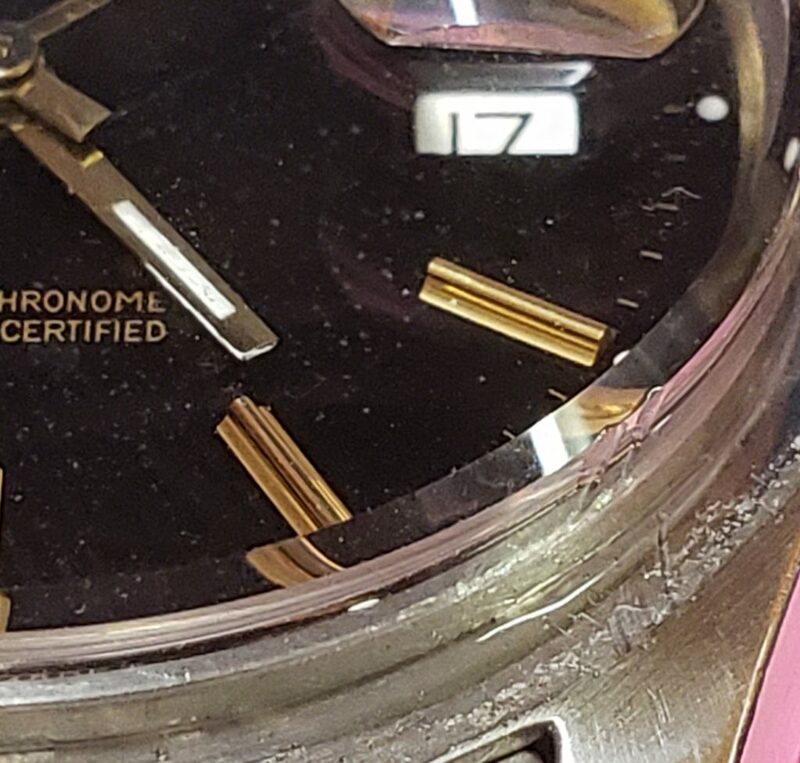 What is the cost to replace a chipped crystal on a late 1980s/early 1990s Submariner/date? This is interesting information. I have a 1960s gold Tiffany (actually Movado) square case watch with a crystal that fell out of the case. I simply popped it back in place. Since that time I wore it on other occasions with no problems. If I send it to you what would you do to insure that the problem doesn’t occur again? As usual, a great article. I wonder if one crystal is better/tougher/clearer than the other or easier installed. Sapphire is much tougher and does not scratch very easily. Very interesting article even though I am a clock person and am not into wristbwatches. Are the two types of crystals interchangeable on the same watch? No, if the watch is designed for plastic, that is how it must stay. Excellent read Mark! Thanks for your expertise! You replaced mine and did a fabulous job! 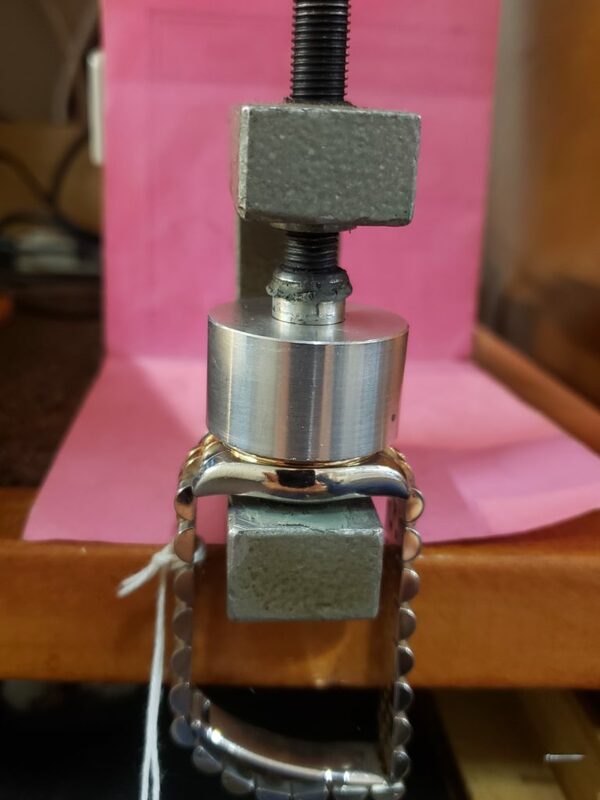 Great explanation of how the crystal is replaced, mounted and pressure tested. Thanks for so much education. Thank you for your insight, Mark! I was just thinking of how little I knew about my Rolex until I had it 35 years! Again, thanks for your dedication to the industry. Mark: Great Info. Unbuckled Seatbelt, threw it aside & Metal Nose struck My 1988 Submariner Crystal. Shattered like “well”. This was back in 1996; cost Me $400.00. That would have bought several Bottles of Forget-Fullness, lol. When its ready for service, I will no doubt send it to You. You may not remember Me; I’m the One that inquired months ago; about repairing My Ole AquaStar Benthos 500. Hi Buddy, that is a great writing, I have gone through entirely and each words, it a great writing skill. Sometimes I was thinking to get over, but due to heavy working schedule I can not.